I found it difficult to figure out what buffering was applied to the standard streams. depicted in the DIAgram below. Note the 3 buffers involved in the connection. efficiently copy data as soon as it's received (on linux at least). and for efficiency are only allocated on first use of these streams. both the buffer sizes and modes (Unbuffered, Buffered, Line Buffered). and one wants to both see the data as it appears and filter the data. For example, one wants to filter the output of tcpdump -l or tail -f etc. can't be used in this application. accessing a web site while filtering out consecutive access from a particular IP. 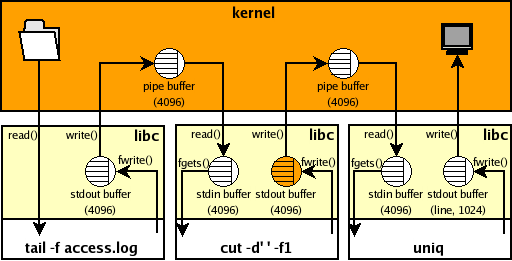 in the log file, because of the automatic stdio buffering applied by libc. as depicted in the following DIAgram. and hence will automatically buffer up data into 4096 byte chunks before sending to uniq. (as do tcpdump -l, grep --line-buffered and sed --unbuffered for example). flushed when a new line is written to it which is fine for our needs. Buffering on stdin like stdout is used (to coalesce reads) for efficiency. One would have more control with byte by byte reads, but that would not be practical. As you can see the first sed process reads all the data, starving the rest. have no affect as that only controls when output is flushed. 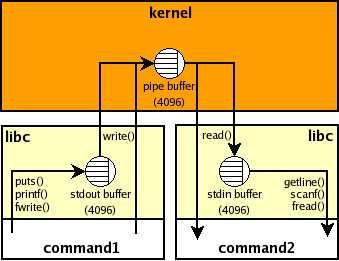 Reading lines from stdin is a common requirement but implemented above the stdin buffer. does not know this and so it will read the data on its behalf. then the ssh client will block trying to read from stdin which will consequently stall the app. One can tell ssh to ignore stdin and to fork to the background when appropriate with the -f option. and buffer size used using the setvbuf library call, as can be seen in my example program. It should be noted here that changing the buffering for a stream can have unexpected effects. For example glibc (2.3.5 at least) will do a read(blksize) after every fseek() if buffering is on. example above into thinking that it is connected to a terminal. can currently only control toggling between line and fully buffered mode. and in addition there is the increased possibility of running out of ptys on the system. Note use stdbuf -o0 if your data is not line oriented. was suggested previously and independently of me and was rejected. coreutils-0.94 to illustrate what is required to support the pipeline above. Many thanks to Bob Proulx for feedback and ideas for this page.